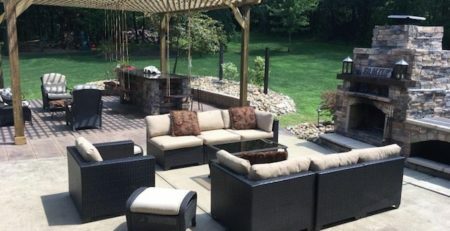 Getting your outdoor furniture and structures ready for the season? Grab a paint brush and do a quick spruce up of your front door, patio furniture, and other structures. The summer heat that will be here soon can crack and warp a wooden front door’s surface over time. Repainting or staining doors, wooden benches, and furniture can help protect those wood surfaces from the elements. It also makes it look fresh and welcoming! Assess your larger outdoor wooden structures such as pergola, deck, trellis, or fence and decide if it’s time to add another coat of sealant or stain to preserve the natural look of your wood. Spring is the time to clean, refresh, and get your patio furniture ready to use again, and it’s also a good time to do some maintenance for wood pergola kits, gazebo kits, or other wooden outdoor shade structures. Here are a couple of handy tips about our pergolas when it comes to staining or sealing. 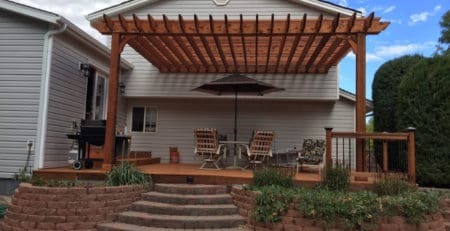 The pergola lumber does not need to be stained or water sealed right away, but as with any lumber it will weather to a gray color over time if not stained or sealed. 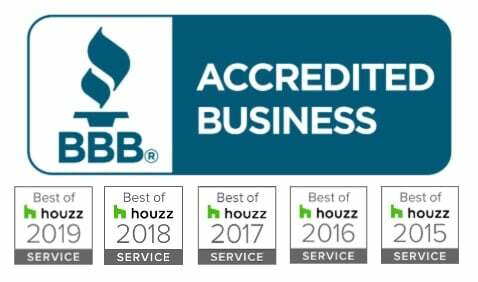 To keep the lumber looking its best and to help prevent warping and cracking, we recommend sealing it once the first year, then every 2nd year thereafter. 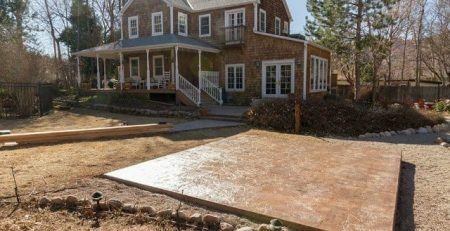 Remember, for pine pergola kits, you’ll have to wait a few months (depending upon your climate and weather conditions) after it’s installed in order for the lumber to be dry enough to absorb the stain or sealant. 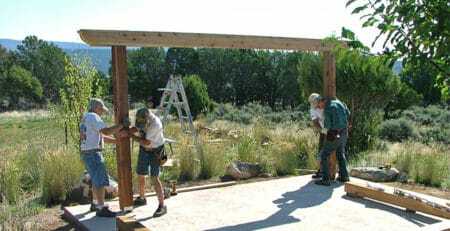 For cedar pergola kits, you can stain or paint the pergola once it’s assembled. You can purchase a stain and water seal combination from any hardware store that goes on in one application and can save tons of time. There are many choices out there for stain that will give you the look you desire. Shop around and ask at your local hardware or paint store to find the best choice for all of your spring paint and stain projects. 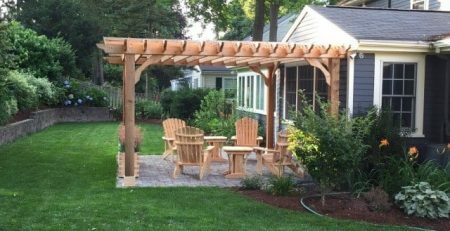 If you’re still thinking about a structure for your patio and you’re browsing our wood pergola kits, consider these factors when comparing your choice of pine or cedar. Both types of wood we use for our pergolas are insect and rot resistant, so whichever pergola wood type you choose, you’ll know it’s made from a sturdy material that is resistant to bugs and rotting. Another feature that is naturally present with our wood types is they are both able to withstand severe elements, including high winds, heavy rain, and extreme cold. Western Red Cedar is a beautiful light amber color and is one of the top wood choices for wood pergola kits. Many homeowners choose cedar because of its appealing fragrance. Western red cedar is also highly resistant to decay, which makes it great for outdoor use. It is lightweight with close, even grain. It is easily worked and can be finished smooth with little effort. This type of cedar takes paints and stains very well. Paint or stain can be applied as soon as you receive the pergola kit. Choose cedar if you live where the weather is oftentimes severe. Pressure Treated Pine is also very insect and rot repellant, and able to withstand severe elements, but has chemicals added to give it those properties. Pressure treated pine comes with a green appearance. As it dries it will turn to a golden brown, then gray if it is not water sealed or stained. 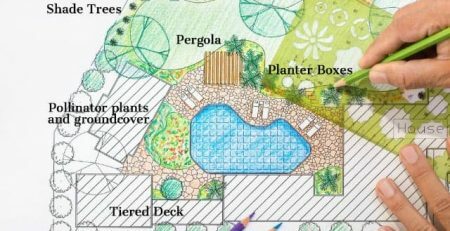 You will need to wait until after your pine pergola is installed to stain or paint it – wait a few months before staining or painting the lumber since it will be saturated with the pressure treatment when you get it. So, before the season is in full swing, now’s the time to grab your brushes for a spring spiff up of the patio furniture and your outdoor structures. Before you know it, the summer BBQ season will be here, and we’ll be looking for a shady spot to relax and stay cool!